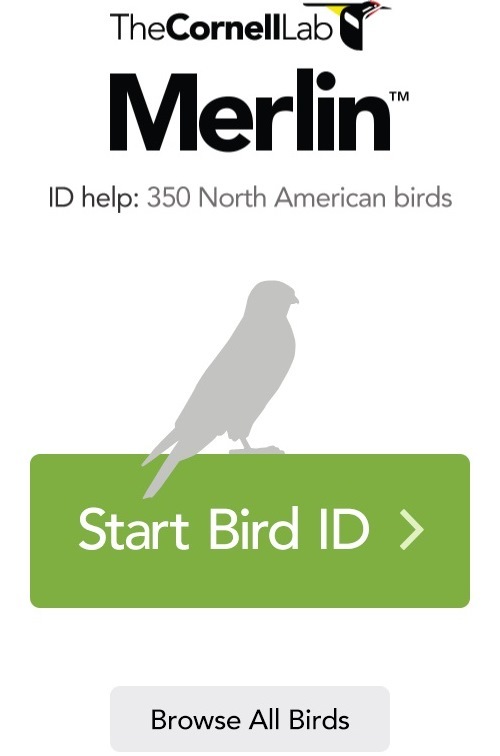 The Merlin App from Cornell will help you quickly and accurately identify just about any bird species that comes our way. Using the program also helps add to the ever-growing database in the eBird Project, a joint venture between The Audubon Society and The Cornell Lab of Ornithology. It’s mid-April now and the first shoots of green are starting to push up through woodland lots, deciduous trees have begun to bud and the song of the American Robin is once again a daily treat. The familiar “oggggrrrrrlllllllyyyyyy, oggggrrrrrlllllllyyyyyy” call of Red Wing Blackbirds can be heard throughout local wetlands. Across Long Island spring has sprung, as the saying goes, and the northward aviary migration is now in full swing. Many of the birds on the move at this time of the year can be difficult to identify, especially for novice birders. Several species, in fact, may be stopping by for nothing more than a slight breather on their journey north, making them uncommon guests as opposed to the resident winged friends which most people easily recognize. Sure, we know the ospreys of our local marsh, and the mourning doves with their solemn song, but the passers-by can be tough to identify. Because we are dealing with large groups of birds, many within the same genus heading to similar regions to nest, classification can be confusing and even frustrating. Figure 1. The opening screen of the application. You can use this program as a field guide, or as a tool to figure out what exactly is the bird at which you are looking. If figuring out just which species of birds are stopping by your feeder, hopping across your back yard or landing in your oak trees, pepper bushes and shrubs, the Ornithology Lab at Cornell University has an app for that. 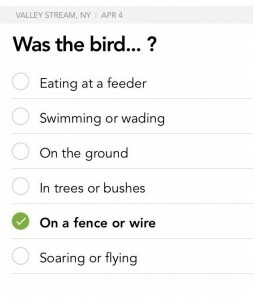 They’ve recently unveiled a new smartphone program designed to help identify these feathered travelers. Called Merlin, this program is now available free of charge for your Apple or Android devices. With this software users can ascertain, through a series of simple questions, exactly which avian specimen has caught their attention. 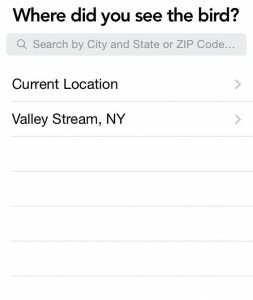 Using location as an initial hint, the program prompts the user with questions about size, color and habit to make a positive identification. Technology like this is particularly useful with small shorebirds. Popularly referred to as “peeps,” the species in this group are notoriously difficult to differentiate from one another because the field marks used to separate each species are often quite similar. Consider, too that these birds generally fly quickly or run on the ground and, during peak periods of migration travel in mixed flocks and it’s easy to appreciate the margin for error. Even in farm yards, wooded lots and parklands far removed from the seashore, the many warblers that pass through during the northbound spring migration can confuse experienced birders. With this new software, however, much of the guesswork can be removed. 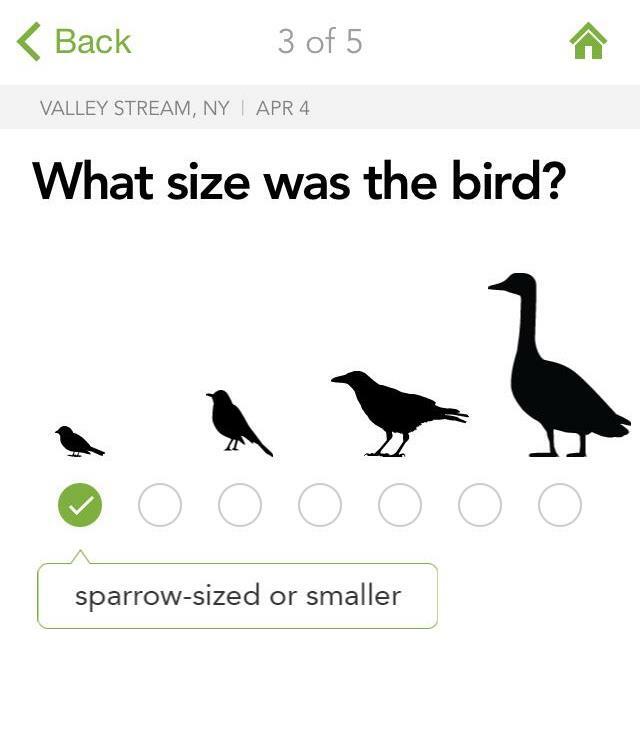 Cornell’s new birding app is a component of what is known as the eBird Project, a joint venture between The Audubon Society and The Cornell Lab of Ornithology. 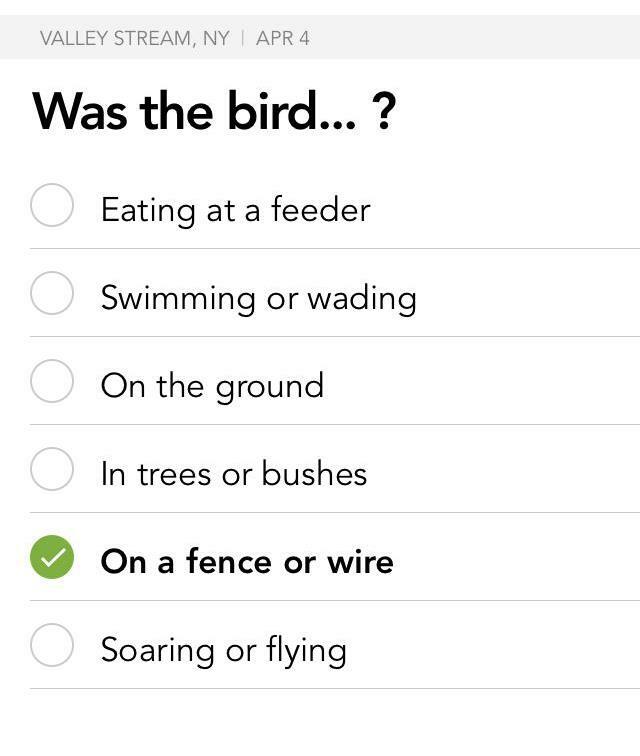 Introduced in 2002, this online checklist program records real time data as it is entered by participants with the goal of mining the data obtained by a global network of professional and recreational bird watchers. This project has become the fastest growing biodiversity data resource in the world and should lead to a better understanding of bird distribution across the globe. Using the app is your chance to be a part of the project. The success of this application is a really a win/win situation for everyone involved, plus the birds being spotted. While the app helps users identify anything from a hummingbird to a Great Horned Owl, those who use the program help build the database. 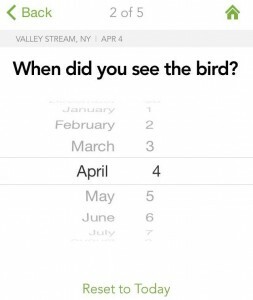 Each time you use the app to successfully identify a bird, the record is uploaded along with GPS coordinates to help the system servers track bird migrations as they actually progress. Uploading of the data is accomplished in a way that allows the system to incorporate the approximate area of any species spotted into its matrix so that it is made available as a possible species identity for other birders in the immediate area. This way, even unusual vagrants will appear in the potential species list for other birders inputting similar characteristics if the entry is made within a reasonable timeframe. Figure 2. 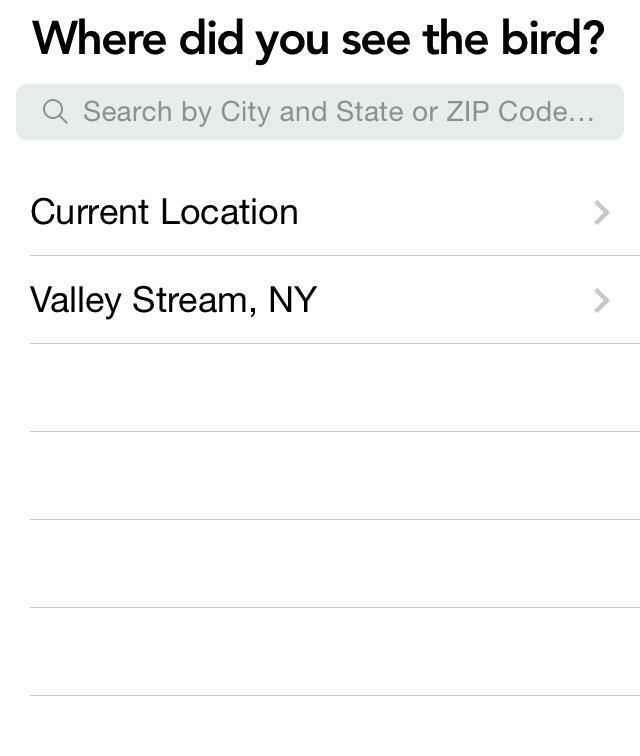 You have the option of choosing your current location, or another point. Figure 3. Enter the sighting date and Cornell compares the entry to records in the same time frame. Figure 4. Using the provided scale, enter the size of the bird observed. Figure 5. 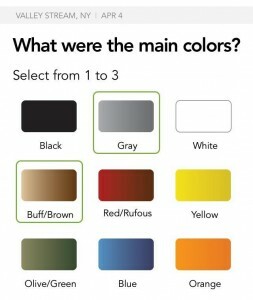 Pick the colors; you can chose up to three. Figure 6. Enter the environment in which you viewed the bird. Figure 7. The program takes a minute to calculate. Figure 8. 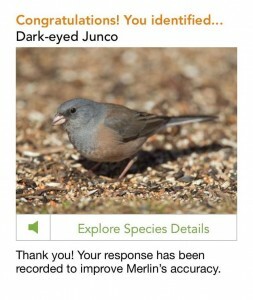 The first option provided is the bird most common in your area at the time. You can scroll down to see other options, until you find an exact match. Figure 9. 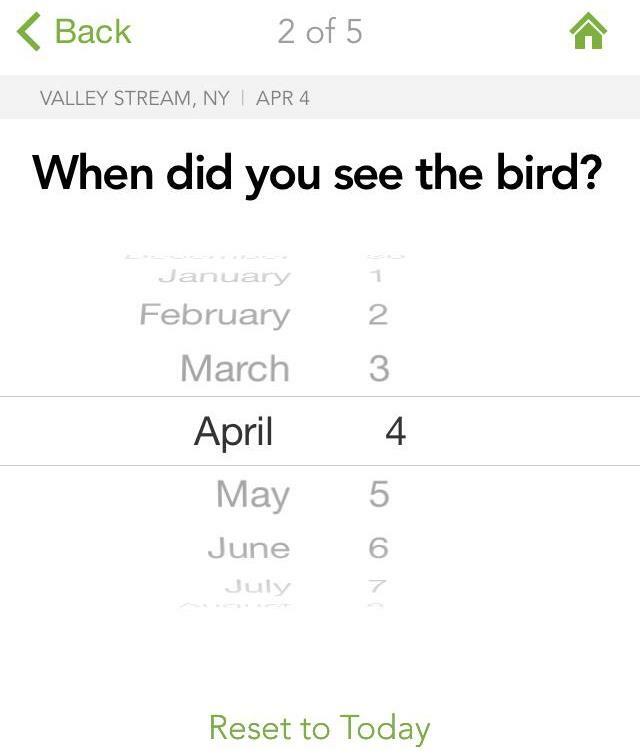 Once you have determined a match, click ‘This Is My Bird!’ to send a report to Cornell that may help other birders. 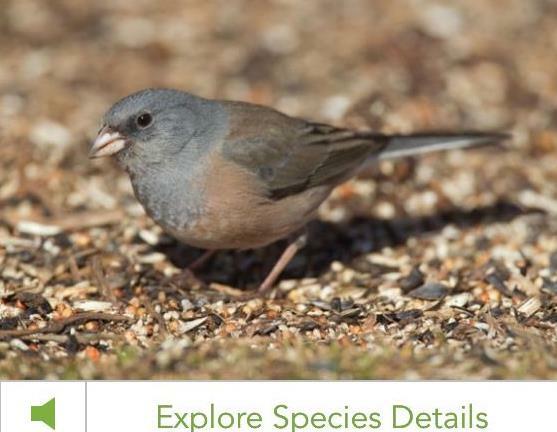 You can then get additional info on the selected species, or choose to identify more birds. While many novice birders enjoy relying on field guide photographs to make positive identifications, veteran birders offer strong arguments for the use of illustrations. Because illustrations and line art are an artists’ interpretation of an image, a little bit of license allows them to emphasize notable field marks. While a photo of an individual sparrow may not highlight the eye line, for example, a rendering can bring it out more prominently. For this reason, it’s a good idea to carry an illustrated field guide whenever possible. I prefer to have a paper copy handy, but the following apps can be just as useful. Prices for these range from $.99 to about $20, depending on the version selected and sales opportunities you may find online. 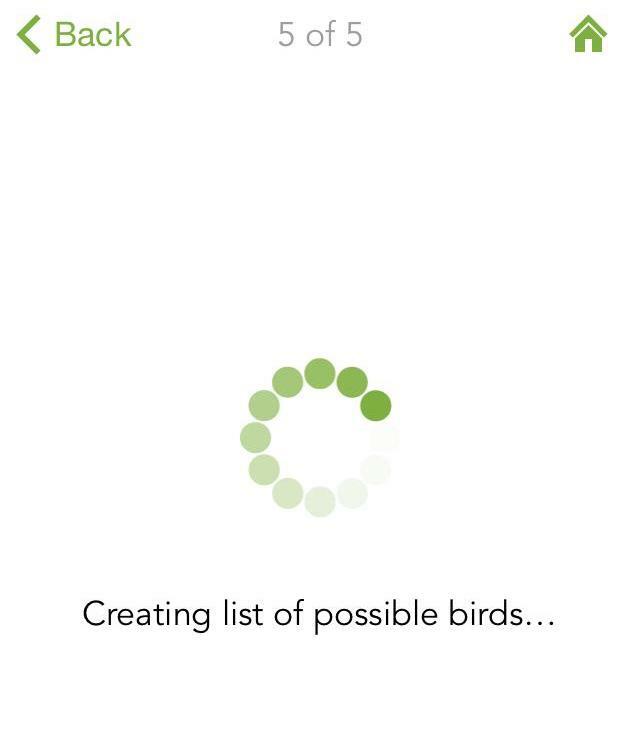 iBird Pro: This was the first serious birding app on the market. It allows searching of bird species by name, genera or alphabetically. It has paintings, photos, calls, and a range map for all species. 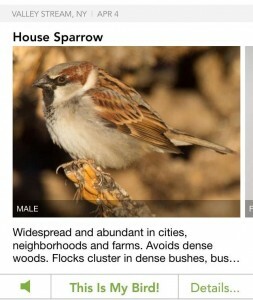 National Geographic Birds: This app features the same illustrations as the text version. While small, the illustrations are of high enough resolution to be enlarged for easier viewing. The audio component contains one call and one song for each bird species covered. Sibley eGuide to Birds: Use this program to search taxonomically or alphabetically. The audio portion is impressive, with many songs for each specimen. Range maps are provided and navigation is simple. Peterson Birds: Although not dog-eared like my favorite paper copy, you can now take the iconic illustrations found in the Peterson Guides everywhere you take your phone. This program contains range maps just like the paper version, and you can hear calls at the push of a button. Search for species by name or by family. If you still prefer to carry a hard copy afield, any of the following entries are tough to beat. All can be found online at Amazon.com and on additional websites. My copies are admittedly worn and dated so new suggestions are welcome. 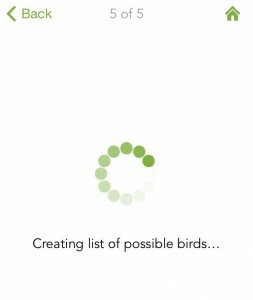 Shoot me an email with a brief description of your favorite birding books and apps and I’ll be glad to add them to a follow-up post in the Outdoors Extras section of OutdoorTom.com. For the beginning birder, Bird Songs, 250 North American Birds In Song, by Les Beletsky, has solid illustrations, interesting narrative and features audio from The Cornell Lab of Ornithology for each of the species covered. New: $24.90. With excellent photos accompanied by concise yet detailed and accurate reference notes, the National Audubon Society’s Field Guide To Birds, Eastern Region, has been my standard guide for years. 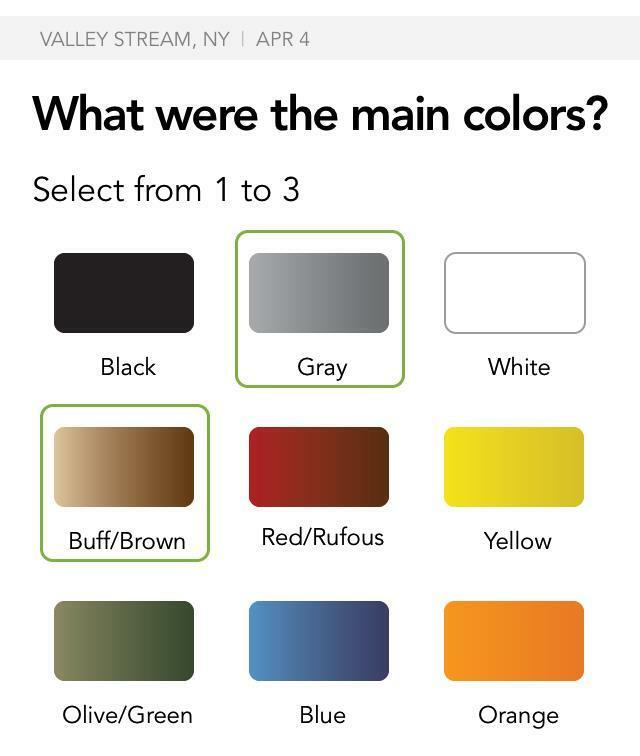 It covers nearly 650 species of birds, arranged in a format that makes it easy to use color and general characteristics to quickly find logical choices. New: $14.95. Sea Birds, An Identification Guide, by Peter Harrison, has for many years served me well along the shore, on the bays and out in the open ocean. 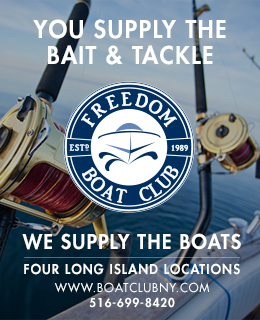 Featuring over 1,600 entries, this book is more than you’ll need as a casual observer but there’s nothing wrong with having such a great resource available if you head offshore or travel to the coastal and ocean waters of faraway places. New: $68.88.